Shorter rotations mean greater profit per acre for the entire farm because of higher alfalfa yield, higher forage quality, reduced pesticide use, greater nitrogen credits, and increased corn yields. Alfalfa is a major profit center on most dairy farms. Annual yield has the largest impact on its profitability because inputs, including harvesting costs, change little as yield increases. 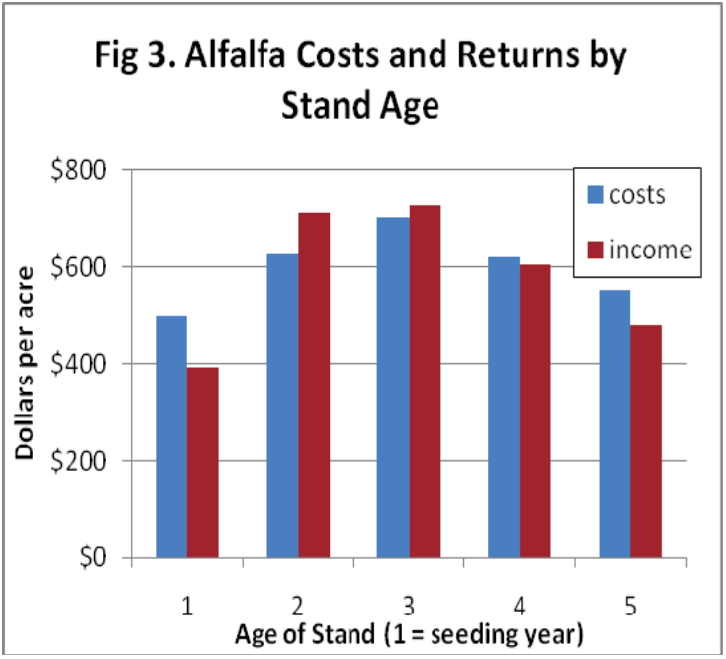 This is shown clearly in figure 1 where on-farm measurements of alfalfa yield and inputs showed that yield was the single most important factor determining profit. The relationship is so strong that farmers should do all they can to remain in the high yield range with their alfalfa. One of the challenges to alfalfa profitability is declining yield as the stand ages. The declining yield is due to environmental stresses, wheel traffic and diseases that appear as the stand ages. As Figure 2 shows, average yield decline of alfalfa in the Midwest is 17% in the third production year and 34% in the fourth production year. Declines were generally greater east of the Mississippi and slightly less to the west of the Mississippi, unless under irrigation. 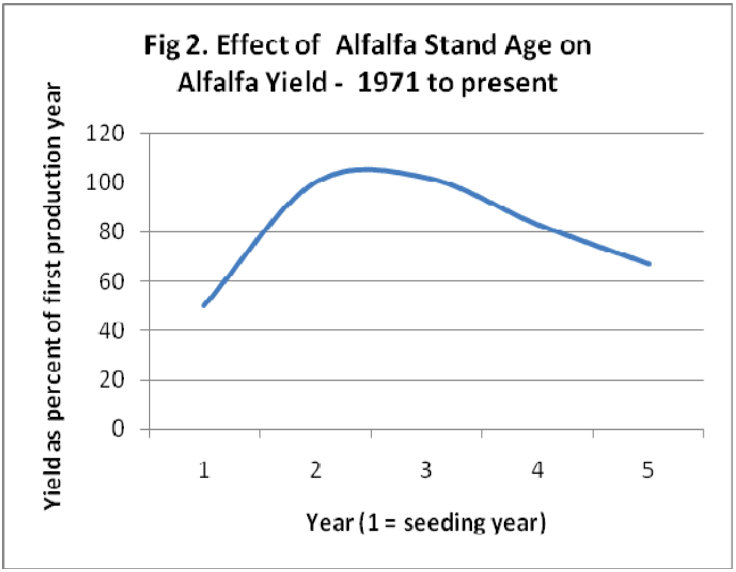 Alfalfa yield decline with advancing age means that farmers should consider turning over stands faster to stay in a high yield range. The economic analysis included costs of all fixed and variable inputs. We used the Minnesota custom rate guide for machinery costs and current costs (Oct, 2008) of all other inputs. A land charge ($72/a) is included as well as a return to management. One may increase annual land charge by adding desired amount to the total costs if desired. 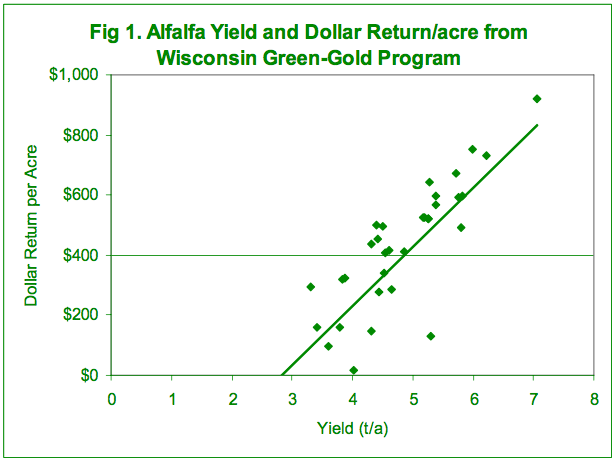 Equally as important, alfalfa increases profit of other crops in the rotation. The difference is especially dramatic for corn grain. 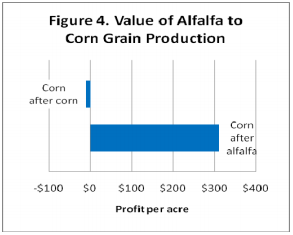 As shown in figure 4, if corn is valued at $4.18/bu and nitrogen at $0.96/lb, corn after corn loses about $10 per acre due to high nitrogen costs.On the other hand, following alfalfa, corn production results in a profit of $310/a because there is no need for nitrogen fertilizer (other than starter) and because corn yields 10 to 15% more following alfalfa compared to corn following corn. 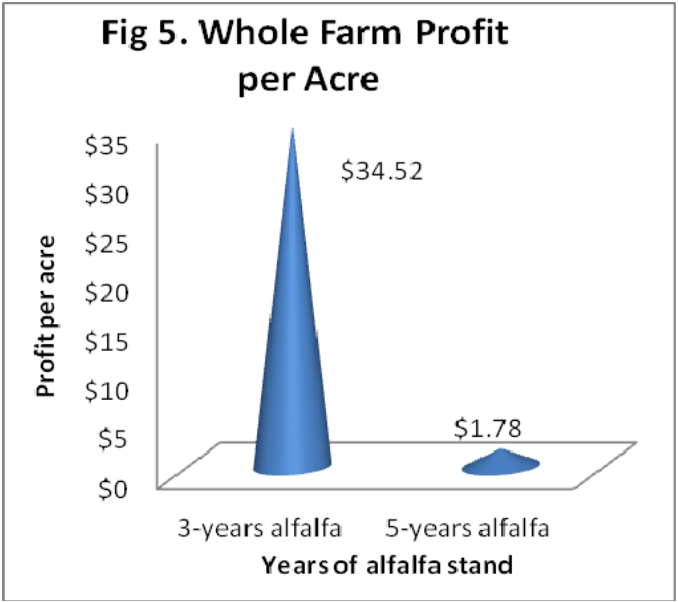 Figure 5 takes the above factors into account and shows the impact of shorter alfalfa rotations on total farm profitability. Due to higher yields of both alfalfa and corn, for both grain and silage, as well as reduced nitrogen fertilizer costs, farm profitability has increased almost $33 per acre for every acre of the farm with shorter alfalfa stand life! While actual numbers will vary on individual farms, depending on their yields and costs of inputs, the above principles pertain to all farms. All will see improved profitability from shorter rotations.